It should be the same for every other version of Ubuntu and all other Linux distros, but I make no guarantee. Linux (on which Ubuntu is based) is fundamentally a command line driven operating system. While there are graphical interfaces to many of the available commands, sometimes you need (or have no choice) to work at the command line. man is the help file. For some reason, there is no man page for the command cd. Pipes allow you to send the displayed output from one command to another command. In other words, when you enter a command that displays a bunch of information on the terminal (and maybe scrolls past the top of the terminal), you can use a pipe to send that information to another command. The most common use of pipes is with the more command. This is especially true when information scrolls past the top of the terminal. The pipe is the vertical bar (or broken bar) symbol: ‘|‘. You can pipe together as many commands as you like. The output from the command on the left of the pipe is sent to the command on the right of the pipe. Sometimes you need to capture the information displayed by a command. This is done using redirection. The redirection operator is the greater than symbol: ‘&gt’. 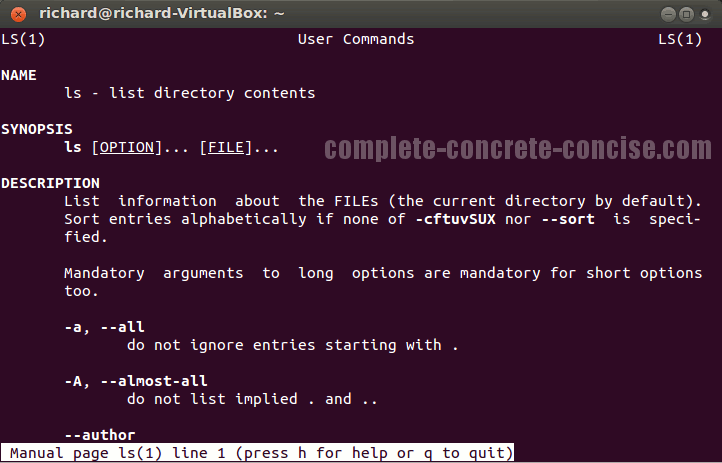 The above command will send the output of the man page for ls to a file called ls.txt. I can then handle ls.txt the same way I handle any text file. The above command will send the output of ls to a file called directory_list. Again, the file can be handled the same way any other text file is handled. Redirection always send stores the file in the current directory (normally, this will be your /home/<user> directory). 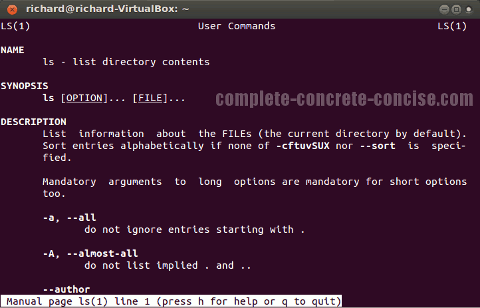 You can write the file to another directory by either (1) changing to a different directory (using the cd command), or (2) specifying the path along with the file name. Note: you may not have permission to write in other directories, so the operation will fail. more is used to display information one page at a time. where <file name> is the name of the text file to display. There is a slightly more useful command called less that allows you to scroll forwards and backwards through piped information. Aside from that difference less behaves very much like more. ls is used to display the contents of a directory. Directory contents are colour coded. Different files have different colours. There are other colour combinations in use and some colours (notably purple) are reused for other file types.